JYP Entertainment's entry into the Chinese market is expected to make a strong comeback this year. One JYP’s boy group, “BOY STORY”, received the "Most Expected Group in 2019" award at the Chinese awards ceremony. 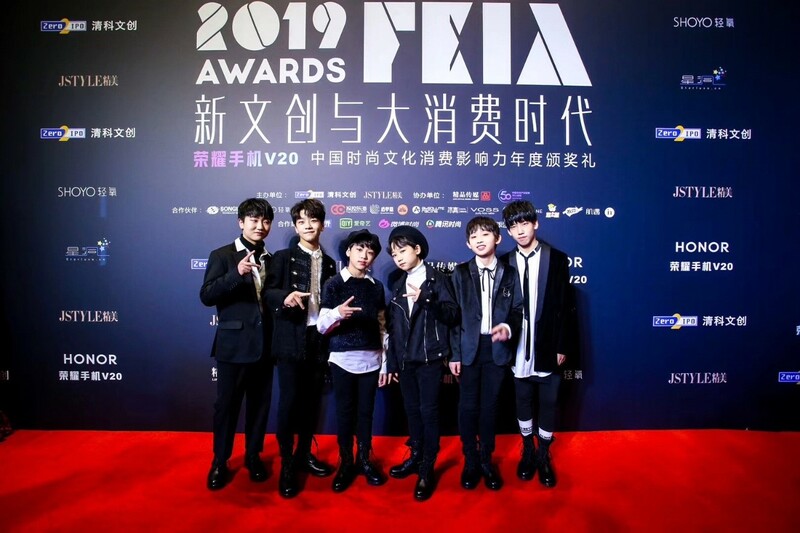 Recently, BOY STORY owned the 2019 AWARDS FEIA (Fashion and Entertainment Influence Awards), which was held in Beijing, China. The awards ceremony, hosted by JSTYLE Jinmi, a major magazine in China, is recognized in its influence of fairness since the key personnel of the fashion, entertainment, and investment industries votes to select the winners. The ceremony became a hot topic since a lot of China's major stars including JYP's artist Nichkhun, Lee Yun di, Joodan, and Zushinji attended the ceremony. With this award, BOY STORY is proven to be one of the groups to be looked forward in China this year as the group continuously surge up with their popularity since they debut last year. Also, BOY STORY announced the conclusion of 'REAL! Project' that was carried out on the 3rd through their official accounts in Weibo as well as in billboards of big cities such as Guangzhou and Nanjing. Before their official debut, BOY STORY released 4 songs of free single album starting with their first single 'HOW OLD R U' in September 2017, 'Can't Stop' in December, 'JUMP UP' in March 2018 and 'Handz Up' in June which already proved their popularity. BOY STORY officially debuted in September last year with their song "Enough" written by Park Jin Yeong. Five songs ranked No. 1 in the chart at QQ Music and Yinyuetai, China's largest MV website. In addition, following photo books of the members were sold out very quickly. BOY STORY participated twice in music chart show ‘YO BANG’, launched by Tencent Music Entertainment, which is based on the top 3 Chinese music websites, "QQ Music," "KUWO Music," and "KUGOU Music," and ranked first in popularity votes among the participating artists. The group’s popularity has been linked to advertising and collaboration with fashion brands. BOY STORY is also selected as the new smartwatch model launched by the largest smart electronics maker in China Xiaoshun (Xiaomi), while the commercial song "Stay Magical" ranked No. 1. on the QQ Music, and the MV on overall chart. Moreover, BOY STORY got the attention as a new fashionista through partnerships with many fashion brands such as Boy London Korea and PONY. Boy Story was recognized as "Asia Rookie" at the KBEE 2018 in Singapore, hosted by The Ministry of Trade, Industry and Energy, under supervision of KOTRA, and successfully finished the debut showcase tour in four Chinese cities including Guangzhou, Taipei, Shanghai and Beijing in September and October last year. Through the reality show 'BOY STORY SUPER DEBUT', which was produced by QQ Music with full investment, the members communicated closely with their fans, and they released a fan song entitled "For U" for their own fan ‘BOSS’ in November last year. The foreign media also paid attention to BOY STORY. Bill board said, ‘The debut song "Enough," of the BOY STORY, consists of all Chinese members, shoed their own story through hip-hop”. The Global Times, an English-language version of the Chinese media, said that “out of many idol groups that have appeared in the past two years, they have become famous in abroad. Their debut song 'Enough' has been viewed more than 3 million times on YouTube. Fans are posting comments in English, Spanish, Russian and Arabic and the number of followers is rapidly increasing compare to other Chinese idols. Fans are paying attention to the group’s potential to become global idols”. As shown, BOY STORY has been busy since they debut last year and they are currently preparing for a new project for this year which garnered curiosity and expectations from their fans too. As the agency of BOY STORY SHINSUNG Entertainment announced, the group rapidly got popular with Chinese fans. With 'REAL! Project', they will show the fans that they have grown as a boy band as well as through our new project in 2019 and let them establish the team as the "Best Idol."